Experience strategy, research oversight, interaction and visual design governance. The Challenge: The airport self-service kiosks needed to undergo a replatforming to retire old infrastructure, and we took that opportunity to do some work on the front-end experience as well. 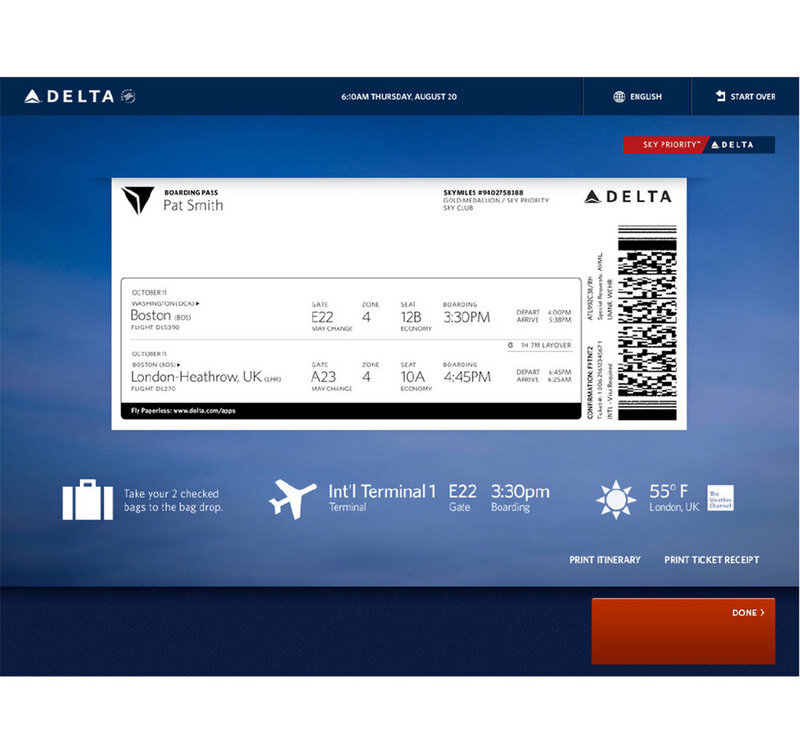 The Strategy: Though the popularity of the Fly Delta app has shifted a large amount of check-in traffic, a significant number of customers still need to interact with a kiosk in the lobby. It was important to modernize the design of the kiosk and improve the overall experience for these customers, while creating revenue opportunities in the form of strategic product upsell. The Considerations: Traffic in the airport lobby is a huge consideration, and we had a critical requirement from our Airport Customer Service business partners to decrease transaction time of the kiosk experience while retaining as much self-service functionality as possible. The Outcome: My team relied heavily on user research, both primary (modified contextual inquiry) and secondary (airport agent interviews) to build differentiated and simplified user experience. As a result, transaction time for standard check-ins decreased by nearly 30% and success rates increased by more than 5%.